Sir Winston Churchill's legacy as wartime leader, statesman and a man was remembered as a sculpture and stained glass window were unveiled to mark the 50th anniversary of his death. In the quiet parish church of St Martin in the Oxfordshire village of Bladon where Churchill was buried, the Duchess of Cornwall unveiled a new window that depicts elements of his life in stained glass. The former prime minister received the rare honour of a full state funeral following his death on January 24 1965. An imposing bust of the former prime minister was also unveiled by Camilla at nearby Blenheim Palace where the statesman was born, erected in the grounds of a new memorial garden. Churchill's relatives led by his grandson, Sir Nicholas Soames, and Jamie Blandford, the 12th Duke of Marlborough - whose father was a cousin of Sir Winston, filled the pews of St Martin's church for the unveiling of the window. The rector, the Reverend Canon Adrian Daffern, told those gathered: "Many hundreds of thousands have made the same journey before you, many, if not most, have come to see, the grave, the grave of a hero - a leader, an inspirational figure, the greats perhaps of all great Britons." He told the congregation how some visitors were surprised by the simplicity of Churchill's grave, a slab of stone with just his name and the dates of his life. He added: "The fact is the real memorial to Sir Winston lies in his legacy, some of it controversial, much of it disputed even, but all of it breathtaking, awe inspiring - beautiful, dedicated, defiant..."
Emma Blount, an award-winning artist, has designed a window which reflects Christian themes and Churchill's life. Two lights depict St Martin and St Alban - Britain's first martyr - while its borders are filled with many symbols of Sir Winston's life, including cigars, his favourite Pol Roger champagne, his beloved poodles Rufus 1 and Rufus 2, and the famous "V for victory". The window is also inscribed with aphorisms and speeches, including many less well-known statements concerning his religious beliefs. 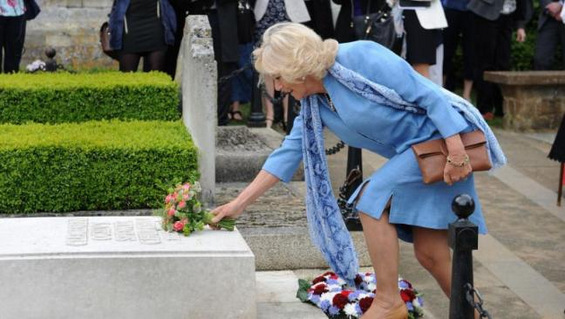 The memorial garden to the wartime leader was conceived by the 11th Duke of Marlborough before his death last year and was laid out next to the Temple of Diana where Sir Winston proposed to his wife in 1908. Sir Nicholas Soames, a close friend of the Prince of Wales, gave a short speech to the congregation who had moved from the church to the open space. He said: "Of this place, Churchill, who truly loved Blenheim and its family, said this: 'I took two very important decisions at Blenheim, first to be born and second to marry, and I am entirely content with the decisions that I took on both these occasions." Sir Nicholas said about Sir Winston's proposal and the garden: "It overlooks the unbelievable stunning lake and he proposed to her during a torrential rainstorm, this was a setting that combined for him, true to form, his sense of both the romantic and the heroic." The simple garden of trees and poppies, that will flower later in the year, was created by landscape gardener Kim Wilkie, the perfect setting for a bust of Sir Winston by sculptor Oscar Nemon, whose towering sculpture of the wartime leader stands in the member's lobby at parliament. Before the bust was unveiled by Camilla, Sir Nicholas paid tribute to his grandfather's life: "Astride two centuries, through two world wars and throughout serving six of the Kings and Queens of England." He added: "Churchill was himself a very keen and expert landscape gardener to which not least (his Kent home) Chartwell is a living testimony, as are many of his paintings - he would truly have loved this place."